LVB Probationary Officer Interview Call Letter 2017 - Download Lakshmi Vikas Bank PO Appointment Letter 2015 - Download LV Bank PO Final Result 2017 at www.lvbank.com. Lakshmi Vikas Bank has released Interview Call Letters for Probationary Officer 2017 on official website at www.lvbank.com.The interview has been scheduled from 12th June to 16th June 2017 at Chennai. LV Bank Interview call letter can be downloaded from the link given at the end of this page. The final selection of the suitable candidates for Junior Officer Posts will be made on the basis of performance in online written test and personal interview. The LVB Probationary Officer Examination 2017 will be conducted by ONLINE MODE. OMR sheet will be not given to be filled by Blue/Black ball point pen. In LVB PO Examination 2017, blank sheet will be provided for calculation work. The LVB PO Examination 2017 will be an objective type examination. A multiple choice question paper will be displayed on the computer in which five options will be provided as answer to the candidates. You will select one correct answer among these five choices to earn one mark. There is negative marking scheme in this online examination. In LV Bank Probationary Officer Exam, ¼ marks will be deducted for each wrong answer delivered in the examination. 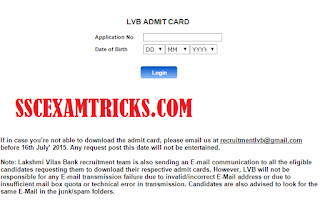 LVB Junior Officer Admit Card 2015 - Download Lakshmi Vikas Bank Hall Ticket 2015 - Download LV bank Call Letter 2015 at lvbank.com. Lakshmi Vilas Bank Limited has released online Hall Tickets in first week of July 2015 on official website www.lvbank.com for written test held on 19.07.2015 at various centres across the state. 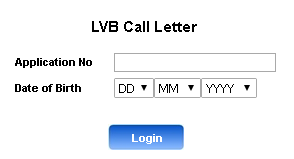 The date, time and venue of examination has mentioned in LV Bank online Call Letter / Hall Ticket. 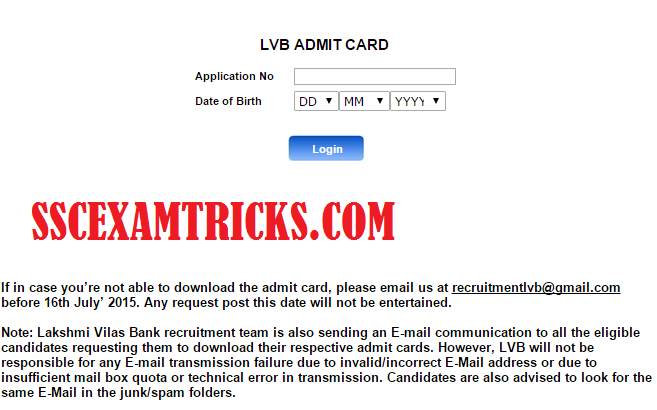 You can download your online admit card / call letter / hall ticket for LVB Junior Officer Exam Date 2015 from direct link given below. · You will login your account to download interview call letter of Lakshmi Vikas Bank Probationary Officer 2017. · Go to direct link mentioned above to download LVB interview letter for PO 2017. · LVB interview letter page will be appeared on your computer / mobile screen. · Enter your application number. · Select your date of birth from drop down list. · Click on the login button. · Now you can download your LV Bank interview letter for probationary officer 2017 as PDF. · Then take print your LV Bank Probationary Officer Interview Letter 2017.